The absolute quickest way that I filter through men that I might be interested in is by height. I love me a tall man. When you spend 96.4% of your life taller than everyone around you, it is a pretty awesome thing when someone makes you feel small, more specifically when he's handsome and hugging you. That being said... boy, does that narrow down the dating pool a TON. Apparently, as of late, I have seemed both extra fantastic and extra tall, because I have gotten several comments like "If I was only two/three/four/eight inches taller; I would totally date you". At first it was strictly flattering, but then I started to experience a hint of frustration. Really? The only reason we can't date is because of my height? It was at the moment that I realized that I was as much of a culprit as any of them, I am a heightist! (Urban Dictionary defines this as one who discriminates based on height). Since coming to this realization, I have spent the last couple of days attempting to reason myself into the idea of dating shorter men, or at least being willing to consider it. Here are a few of the key arguments for why this would be a good idea for me to take for a test drive. #1. Our children will thank us. Granted this is only a predictor, but those are some pretty promising looking heights! Totally normal and non-disadvantaging for any children involved. Apparently this post will be a convincing argument for both parties because I'm sure nearly every short guy would love to gift his sons a little bit of extra height. Turns out, my genetics are very accommodating for that. ...Sorry that I just got so creepy. If love were purely a matter of economics the decision would be pretty clear. That's got to be hundreds, heck probably thousands of dollars per year of savings! #3. How long will it really feel noticeable? I have plenty of short friends. My best friends growing up were significantly shorter than me, and we pretty much spent every waking moment together. After a while it wasn't something I noticed, because it was just the way things were. I've also dated shorter guys before, not significantly shorter, but a good 3-4 inches. After a couple of months, you have adjusted to it, and stop thinking about it. Girls also have this neat ability to develop attraction for someone- nearly every guy that I've dated has become more and more attractive to me over that time, so it only serves to reason that the same would happen with a shorter guy. Eventually, if everything else is there, I'll still think he's hot stuff. Maybe I'll even develop a special fondness for the top of his head, you know, the part of him I have the best view of. #4. His friends will think he's got mad game. When people see a couple that they don't understand from the get-go, like a short guy with a tall girl, they immediately start to reason through the possibilities of how it happened. They'll have no choice but to assume that he has some pretty sweeeet game for him to be able to snag a taller woman, because being a short man can kill your dating game faster than just about anything. 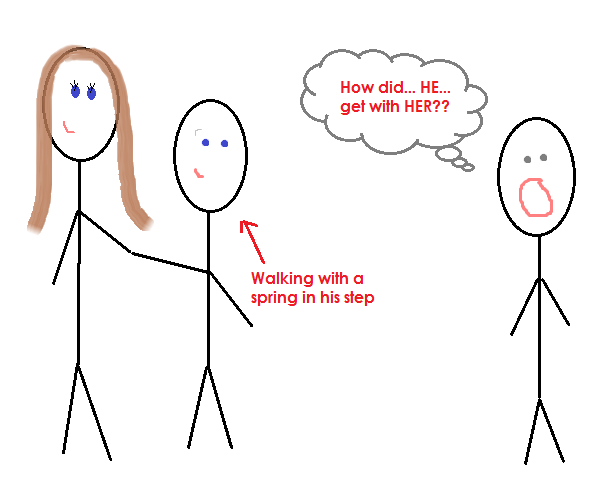 Let's be honest, there's something sort of trophy-esque about proudly escorting your tall (model height, wink-wink) woman out on a date. Now it's not just cool for him, it would certainly be a delight for me to know that I can make a guy feel like he is the cat's pajamas just by going out on the town with him. #5. You will forever have a great conversation starter. This ties into point number four, because people are already curious to hear the "how you met" stories, and they'll be even more curious to know the details on how that guy scored her. As you can tell by the fact that I've had to put together this post, it certainly would take a fair amount of persistence and persuasion for me to decide that I'll sacrifice (practically guaranteed) basketball scholarships for my kids. What that persistence would translate into, would be an excellent story I'm sure. We'll be at a party and I'll say something like "I always swore I would marry a tall man! ", and he'll banter back with "I always knew I could get her to lower her standards for me, get it? L-o-w-e-r?". Riotous laughter would then commence. I will no longer exclude men from my dating pool strictly because of height. *Update 02/14/2013: When I wrote this post I don't know that I believed much would change, but I am currently engaged to a man six inches shorter than me, and it is wonderful! Read the story of how we started dating here. Wow...that's big of you. I will be a heightist at least for a few more years (the point where I give up! haha). I mean I can do an inch or two shorter...but past that its getting a little ridiculous. I just want to wear heels and still feel small...too much to ask? I am holding on to that hope! Roxanne! I hear you on the heels, putting those away will be a sad day indeed. So far this is all theory, we'll see how "big" I feel like being after a little more hands on research. Haha, get it, big? Pun intended! To a male like myself 5'2" who is short because of stunted growth, that's like using the "N" word on me, except I don,t have any rights for protection. Thank you for the compliment, I'm glad the post made you think! You make some interesting points as well, although I don't know that I agree with all of them. I think attraction is very fluid and has so many contributing factors that as long as there is enough of an initial layer there, the depth is more important than the surface characteristics. I blogged my thoughts on that too if you want to check it out: http://www.slightlyawkwardshelly.com/2012/02/truth-you-dont-want-to-know-about.html. Overall your comment made me super curious to know if there have been any kind of studies done that get into the psychology or chemistry involved between height and attraction, all I've found so far is that women are attracted to tall men, nothing gets into the nitty gritty of why. Read The Female Brain By Louann Brizendine MD. It gets into to the whys and how attraction works for the girls (She has another book on the guys aptly named the Male Brain). And it supports your conclusion that for a female long term attraction depends more on the emotional security in the relationship than on the physical attributes. Thanks Jenny! I just ordered it on Amazon, excited to check it out! Another great post! Your drawings are top notch as always. And you get bonus points for using the term "cats pajamas"
If I were a short boy, I'd totally date you. But also if I were a tall boy. In my prime I could eat as much as the fattest man I could find and I'm 5'7". Just saying that your spending habits could adjust to compensate for tall children. However I think this is hilarious and a worthy resolution. Yes! I've thought for years that tall girls should date short boys, and short girls should date tall boys, thus preventing us shorties (shawties?) from having midget children. Within a few generations we'd all even out, and then our children's children will adore us. I thought I was the only person who thought like that. I am 5'8" tall and unlike my shorter girlfriends who are below 5 feet who find short guys unappealing; I will, however, date and prefer dating a guy slightly taller or noticeably shorter than myself. The same goes for my taller girlfriends. You know I loved this post & loved cracking up throughout it! If you married a tall guy, it's probably okay that you're sons would be really tall. For your daughters you could just stunt their growth by encouraging them to workout a lot. Shelly, This is too funny! I have the coolest next door neighbor! Also...I'm loving the artwork on your blog. I just googled this and I'm a short man myself. This is FUNNY! I couldn't stop laughing from the top of the article -- to the bottom. 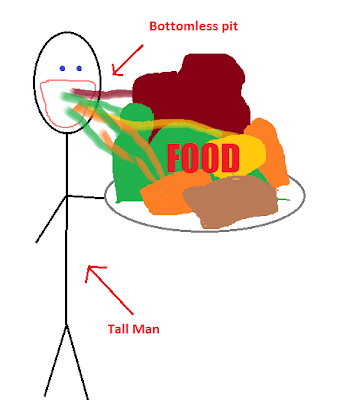 It is true about the food, my 6 foot brother can't stop eating. And height is nothing when I have to defend and save someone from weirdos :P No one harms her or me. I think every girl should at least TRY dating a shorter man. Great great post! Very interesting, and I really appreciate it as well. It makes a lot of sense too. I'm 5'6 guy, and I've always found myself dating women exactly my height or at the most an inch taller than me. I always thought it was an equitable natural occurring resolution to my rejections from short women and my thoughts of being repugnant to taller women. But, your insights coming from a women of your stature certainly helps in changing my thinking in regards to my assumptions of what tall women think about guys my height. Thanks! I'm only a 5'3 guy and always dreamt of dating a woman a lot taller. You're right - it would feel amazing. I loved this whole blog it was really great and funny. I just wanted to tell about how your height chart is on our family. I am 5'3 and my wife is 5'8. We have three daughters that are all very tall like your chart so it works. Daughter 18 is 5'11 daughter 16 5'11 and daughter 16 is 5'10. Well first off let me say I loved the blog it gave me a lot of insight that I was lookin for..I actually am attracted to a shorter friend of mine and doesnt really know how to react to it..Im taking any info I can receive im 5'5" and he's around 5'2"-5'3". All you can do is go for it. If He can't handle being with a tall woman, that is his fault. If he won't go out with you, some short guy will. Most men are taller than 5'5", but it's not really hard to find one shorter than that either. You're tall enough to be considered tall by a bunch of people, and very few will consider you short. I'm 6ft. 1, making me no giant, as a man, but tall. Also, for the past few years, I've lived in France, where the average guy is a bit shorter than in the U.S. For most of my life, I've dated women 6 to 10 inches shorter. Recently, and as I've gotten older, and now date women in their late 30s, tall women seem to find me attractive. And I think because of their attraction, I've developed a mutual attraction to them. But maybe also they pick up on the fact that I LIKE who they are and also how they look. I don't focus on a tall woman as an oddity, but focus on her as a woman of beauty (ogle, ogle). Also, I like strong confident women, both in their mind and in their body. I'm certain they pick up on that. Since I'm not particularly short, I can't be counted on as an authority on the secret of dating tall woman. But I have now dated quite a few tall women... if they feel all that love, desire, and respect, coming from my way (not polluted about needless anxieties about height), well... if they like me to, they're bound to respond to it. And indeed, respond they have. So I think that you must not actually be a "heightist" yourself, but have unfortunately been surrounded by the all-too-common man, who cannot set aside his own heightism, denying you the possibility to respond, as the beautiful woman (I'm guessing) you must be. The average height in France for men is actually 1 inch more than the national average in the U.S. If that's the case, maybe I should change my preferences when I scan the dating sites, and go looking for shorter guys. Most of the guys I like are taller than me. I am 5'6 and i overheard someine say that i have short man"s sindrome because I am always trying to out perform everyone in the workplace. My taller co-works are just considered to be ambitious. It is crazy to be acused of having a syndrome because I have a strong work ethic. By the way, my wife is 5'9 blonde bombshell. She was a penthouse pet a few years back. I apologize in advance for my strong feelings on this but I have to agree with an earlier post--this sounds as if you more or less settled on someone versus basic attraction. Basically you want taller men but they are at a premium relative to your height so now it's time to go with Plan B? Get out of here. Anytime you have to make up so many logical reasons to date someone it's shallow and a bit clinical. It's like me saying I want to buy a Ferrari because it's the car of my dreams but I'll settle for a Toyota because it's more inexpensive and I'll get better gas mileage. An attractive person makes you feel intense emotions and in some extreme cases all logic goes out of the window (like when women hook up with a guy they KNOW is bad for them). But if you have to make excuses for him like "food will cost less" and "the children will be normal height" then you are saying this short man must compensate for his lack of height in those areas make himself more appealing. I thought the ultimate goal was to overcome the stigma that Heightism casts on shorter men by showing that we are no less than taller men and have nothing to be apologetic for. It's women like yourself that perpetuate this problem--even in situations like this where at first glance it seems you are providing something positive but upon closer examination you're actually doing a disservice by making tall women appear as if they are some trophy (again implying that taller is better) and that the short guy will attain higher social status because he is with you (as if being short is inferior) -smh-. Spoiler alert. 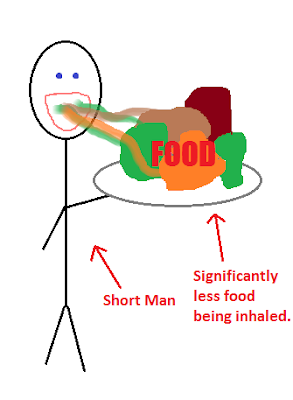 I'm now married to man 6 inches shorter than me, and not because he eats less. height can never conquer matters of the height. do you know why most tall ladies are going for shorter men nowadays? because shorter men work extra hard to love their woman, they are very strong and protect their territory, they are very sweet, they know that its not easy to have a beautiful model looking geniun woman hence they stop loving and appreciating what they have. most of the girls pretend to be happy in their relationships with taller men but in reality they are not cos the taller men think they can get any girl they want. whats the point of caring about what the society will have to say about you if they dont contribute to your happiness. whether he is taller or shorter...... as long as he makes you feel complete, dont even dare make up excuses for you will morn the rest of your life when you see him making another woman happy. people are different, Yes! but also know that your life depends on your choices. tall people can get short children too..... its called GENES. big ups to those that look past all the critics and enjoy being inlove. love got nothing to do with money, height, age, watsoever....... its ur personality that we fall for. Generally Shorter men can be just as hot, charming and killers in the sack as their taller counterparts. I am a short man at 5'6. And let me say this....It disgusts me that these types of articles exist due to the fact that height is still considered an actual factor....I thought that we are a society that embraces the whole "different" factors of people....But it comes to show, that no matter how progressive a society becomes...cosmetics and superficiality will always prevail over logic and even the whole "equality" myth. Interesting article. As a tall man(6ft3) it makes me laugh, my brother is a lot shorter than me (5ft7), I would say he has the better physique/looks and he's considerably more intelligent than me but seems to find it very difficult to attract women. 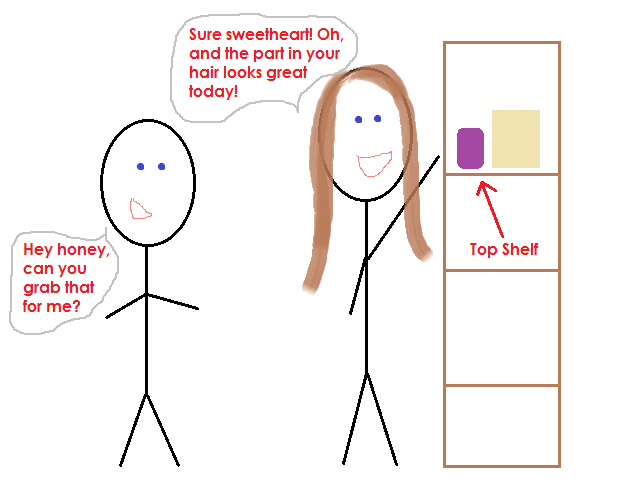 Me on the other hand, women seem to be drawn to me, and I would say its definitely solely down to my height. Hey I'm not complaining, it's just funny how shallow a lot of women are! If we stand to be victims of demeaning articles like this, then we are part of the problem. Instead, we have to prove why short men are the more attractive breed.